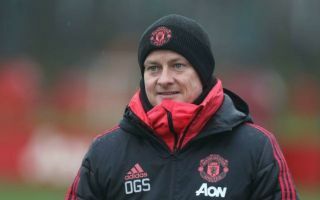 Man Utd have received more good news on the injury front as interim boss Ole Gunnar Solskjaer could be welcoming back some key players this weekend. The Red Devils have been hit with an injury crisis in recent weeks, with a string of first-team players missing recent clashes with Paris Saint-Germain and Southampton. However, based on the video below taken of their training session on Friday, it would appear as though Solskjaer is edging closer towards getting some timely fitness boosts. Jesse Lingard, Nemanja Matic, Ander Herrera and Anthony Martial can all be seen taking part in the session, with the quartet having been absent for recent outings. Further, the Manchester Evening News noted earlier in the day following Solskjaer’s press conference that he was expecting Martial, Matic and Herrera to push for a return. Time will tell though if they get the all-clear to face Arsenal on Sunday evening, as the last thing Man Utd want to do is to rush them back and risk seeing them pick up fresh problems. Nevertheless, it will be a boost for all concerned to just see them stepping up their respective recoveries, although United have continued to impress in their absence. Coupled with the confidence boost and belief that they’ll take from their success in the Champions League in midweek, it could turn out to be a very good week for the Manchester giants depending on Sunday’s result. A number of injured stars returned to training for #MUFC today ahead of Arsenal trip on Sunday.